Meet April Cox, owner of Tupelo Acres, LLC. April owns alpacas which she shears annually, in order to use the fibers for yarn, batting, and roving. She also crochets and felts her own products from the materials she creates! 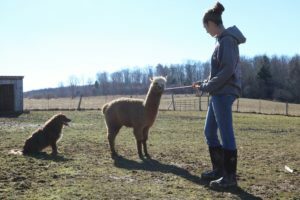 Back in 2012, April and her husband left behind the city and corporate lifestyle and purchased 4 alpacas with no home or land to put them on. 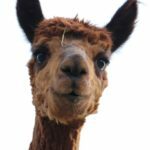 They started volunteering at a local alpaca farm and learned about all forms of fiber arts. After a year of searching, they began their journey on 10 acres of an old abandoned corn field that they rent from a local farmer. Starting from scratch, they settled into an old trailer and started Tupelo Acres LLC. Since then, her alpaca herd has grown to over 20! Each year, April and her husband grow, learn, and grow some more. They strive to use all of the fiber from their animals. Their products are uniquely handcrafted using alpaca fibers from their herd and other assorted fibers including silk and wool. Fiber is sheared from their alpacas annually, and is then skirted, cleaned, and processed into yarn, batting and roving. April decides how the fibers will be blended, dyes the fibers, and creates all of their end products. 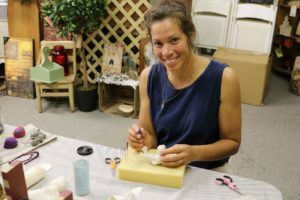 She believes that fiber arts is truly a field to fashion creative process. Her unique set of products range in method from wet felting, needle felting, crochet, spinning, and dye work. Her specialty? 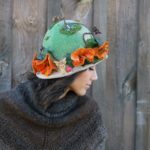 Beautiful, colorful hand-felted hats in her very own custom designs. You can find more info about April and her husband’s company, Tupelo Acres, LLC, by visiting their fun and informative website. You can follow her on Facebook at @PrimitiveScentiments. You can even schedule a visit and take a tour, see a live demo, or take a class. Be sure to check out April’s Etsy Shop where she sells many of her beautiful products!